The Raspberry Pi seems ideal for all kinds of "physical computing" applications, as it is small, cheap, low-powered and yet more powerful and feature rich than a traditional micro-controller. One way to showcase such applications in an educational context could be to control science experiments which require long term measurements and data collection. 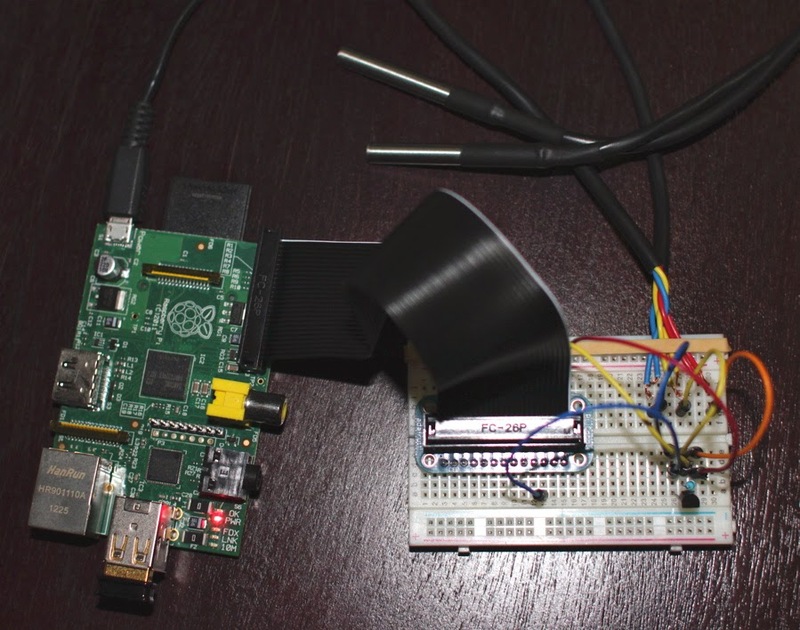 One of the easiest measurement sensors to connect to a Raspberry Pi is the DS18B20 digital thermometer,. It can be read out via a multi-device 1-wire bus that is directly supported by a driver in the Linux kernel. Several sensors can be connected in parallel to the same data-wire and read out individually over the bus interface by their hard-coded IDs. All we need to connect one or more DS18B20 sensors to a Raspberry Pi, is to connect the VCC pin to 3.3V, GND to GND and data to GPIO4 on the Raspberry Pi GPIO header as well as connect a 4.7k Ohm resistor between the VCC and data lines of the sensor. The sensor is available among others as a basic board mounted package as well as a water-proof assembly with a ca. 1m long isolated cable. The whole setup can be assembled without any soldering, using some prototyping tools from Adafruit Industries, a great supplier of electronics parts for hacking, making and education, based in NYC but who also ships world-wide. This great tutorial explains in much detail how to connect both types of DS18B20 sensors using the breadboard & breakout connector. The ribbon cable on fits one-way into the breakout connector due to the notch on one side, but should be mounted to the Raspberry Pi with the cable pointing away as in the picture above and with the different colored wire towards the edge where the CF card slot and micro-USB power connectors are. Using the data collected for inside & outside temperature and a lot of simplifying assumptions, we could for example estimate the amount of thermal flow out of the room and thus how much heating energy the room has used during the measurement period. Or try to reverse-engineer the control function of the heater thermostat by looking at the relationship of outside, inside and heater feed temperature. Read data from DS18B20 Temperature sensor via 1-wire interface. Here we can also identify which ID corresponds to which sensor in our setup. Since it is winter right now, we can assume that 23.5C is the inside temperature, 7.8C the outside and 39.5C is the temperature of the heating pipe. If testing first on a workbench, we can also touch one of the sensors and see which one of the sensor readings is going up towards 37C as a consequence. Right now, we can simultaneously measure the current temperature in each of the 3 zones, but in the next part, we are going to record time-series based measurements into a database for graphing and further analysis.